Readers please note: The content on this blog and also on our sister website will not be updated after 31/12/18. This project is winding down now and we apologise if some of the content becomes out of date. When viewing the information we provide, please bear this in mind. There are a number of other websites who provide a similar service concept to us, it may be of assistance if you also view these sites. Thank you. Duty Free on Arrival is the original search site for Duty Free Shopping around the world, on arrival or departure, by land, sea or air. Before you fly, you can check online for the best prices and the different products you can buy. Our Blog articles will feature updated news and views about shopping in airports, on airlines and around the globe on cruise ships, ferries or even when you cross the border by land. We will update you on any new rules or regulations and with no punches pulled, give you our best advice and tips. 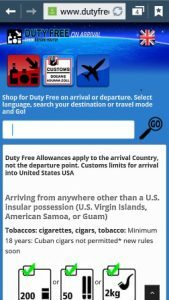 Duty Free on Arrival mobile site. Check before you fly! We are independent, non-aligned and not owned or managed by any Travel Retailer. Our mission is to help you get the best value and convenience and to avoid those dreaded “confiscations” by Security or extra charges by Customs. 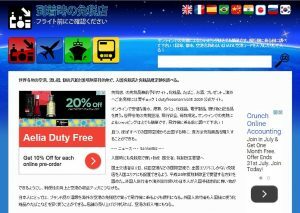 All international travelers can shop at discount prices, by which ever mode of travel you use. To find out more about the stores, rules and allowances at your destination, read our blog…. Or you can search our online global shopping guide and directory for all the stores at your destination. Maybe you are taking a ferry or a cruise ship, or shopping in the port? But first you will cross the border by land and are looking for a Free Shop? We feature every country in the world, with stores offering tax free savings on a multitude of goods. Need to know your allowances, limits, exemptions or restrictions before you buy? Check our Customs section at every travel point. Here you will find the rules that apply to your journey and the limits on arrival. Questions like, “can I buy cigarettes or whisky?” will be answered for you at each and every destination. * We are the original global Duty Free Shopping Guide for Tax Free stores around the world, by any transport mode. Duty Free on Arrival does not sell goods direct, nor do we operate stores. ** DFOA was founded in 2008 and the original global database was launched in 2009. Buying on arrival was a little known concept at that time.